I'm trying to setup TeamCity for sharing my source code of my Minecraft mod I made. I usually use Github but I wanted to try something new for team development. I plan on using the Upsource, Hub, and YouTrack plugins along with TeamCity. I can't seem to get the plugins (Mainly Hub and Upsource) to run and work properly. With Hub, I can't seem to link the URL of my TeamCity server to it, it just uses my laptop's name as the URL. Does anyone know the basic things I need to do first to set this all up and have it all working on different computers (instead of just my laptop)? Did you install Hub plugin in TeamCity? If yes, did you follow these steps? Did you verify the TeamCity Hub service using the Trust button? Please provide screenshots or logs to illustrate your issue. No, I acutally uninstalled everything to start over. Do I install TeamCity first, then Hub or TeamCity and then the plugin and Hub? Also, I get a connection error whenever I tried to open up my Hub server. Also, I got MySQL downloaded and plan on using it as an external server. How do I connect them together and set up the MySQL server? I have another question, how do I set up an external database for TeamCity with MySQL Workbench? TeamCity server and Hub server should be installed first. Then you should install Hub plugin in TeamCity, configure it as noted here and verify the TeamCity service in Hub. See how to set up MySQL database for TeamCity here: https://confluence.jetbrains.com/display/TCD9/Setting+up+an+External+Database#SettingupanExternalDatabase-MySQL. You can use MySQL Workbench to executed listed MySQL command Instead of using MySQL console. How do I set up the Hub program? Do I use my local host server for TeamCity? Unable to initialize logs. The logs directories are not accessible for writing. Please fix permissions and restart TeamCity. You can read more about TeamCity logs in documentation. Do you install TeamCity as service? How did you start it? Please start TeamCity under the same user as it was running before, so it's be able to write into the logs directory. 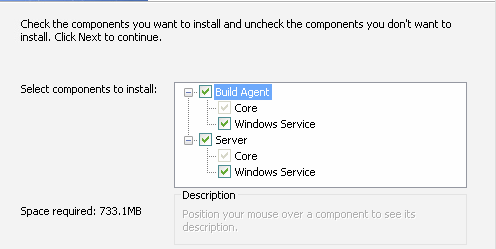 Please check if TeamCity service is in Task Manager > Services list. If TeamCity is there, please right-click on it and start. Ok, I got Hub and TeamCity together, now how do I make the connection available for other computers to access? Also, how do I intergrate Upsource and YouTrack to TeamCity and Hub? Oh, I'm also wondering how do I make my connections secure. TeamCity says that I'm using unsecure connections which makes me uncomfortable about hackers being able to access the servers and get into my computer :O I also got YouTrack up but I have no clue how to get Upsource up. Also, I'm trying to import my entire Github project to TeamCity (with the code and issues) and I have no idea how to do this. To make TeamCity accessible from remote machines you should configure TeamCity servcer port which is not blocked by the firewall. Please see how to configure TeamCity-YouTrack integration in this section: https://confluence.jetbrains.com/display/TCD9/YouTrack. Currently there is no bundled Upsource integration. We are looking into providing Upsource integration as a bundled plugin in one of the future TeamCity versions. As of now you can try the third-party plugin: https://github.com/ksafonov/teamcity-upsource-support. It is recommnded to configured HTTPS in your TeamCity web server and to use unidirectinal Agent-to-Server Communication. 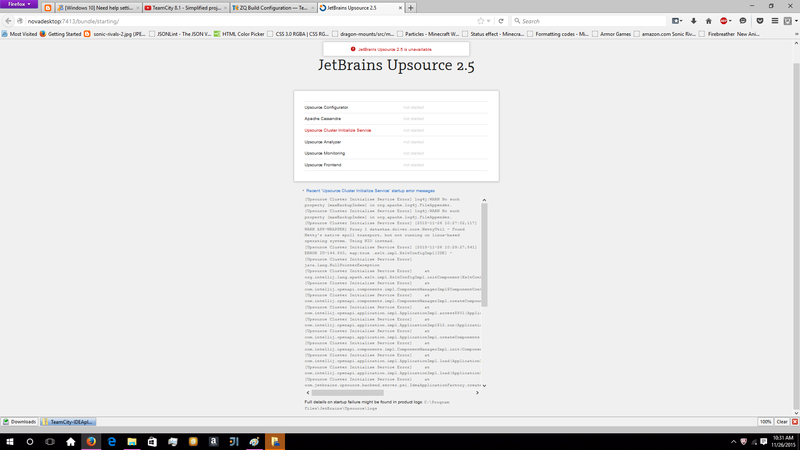 Upsoucre installation steps are described here: https://www.jetbrains.com/upsource/help/2.5/install_config.html. Please the screenscast which shows how to configure TeamCity project from GitHub URL. installed on my computer. Also, I do not have a certificate for the server. And I have no clue how to make the proxies switch to use HTTPS. Also, is there anyway to make a custom URL for YouTrack, Hub, and TeamCity? In order to make TeamCity server accessible by some other url/domain name you should contact your network administrators, as this can involve changing of DNS records. This way you can update the DNS entry to make the address resolve to the IP address of the new server and after all cached DNS results expire, all clients will be automatically using the new server. 1. Switch agents to new URL (requires updating serverUrl property in buildAgent.properties. 2. Upon new server startup do not forget to update Server URL on Server configuration administration page . If you have problems with configuring URL for Upsource and YouTrack support please use Upsorce support and YouTrack forum. Thanks, I got few more questions though, I can't seem to figure out how to install Upsource, I got all of the other 3 products but that one. Also, is the URLs I use to access the clients available on other computers. And furthermore, I can't make an external database and a secure URL connection between the 3 clients (they're saying use HTTPS). Oh wait, I got Upsource setup. But I still can't figure out how to change the proxy to HTTPS and I can't seem to access the products on other computers on the same network. As for your issue, it looks like you've faced with the following bug - https://youtrack.jetbrains.com/issue/UP-4543, which is not fixed yet. Please try installing Upsource to some folder without spaces in the name (e.g. C:\Upsource) and please let me know if it helps. As for proxy configuration, please refer to this doc https://www.jetbrains.com/upsource/help/2.5/proxy_configuration.html, it has both http and https instructions.